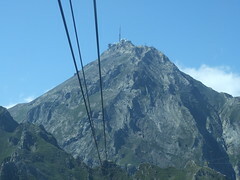 On Wednesday, Audrey, Monica and I went to la Mongie in order to go up on the incredibly expensive cable car to Pic du Midi. The views from up there are really good. 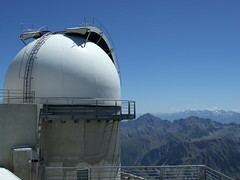 We could see right the way across to the Cirque de Gavarnie. 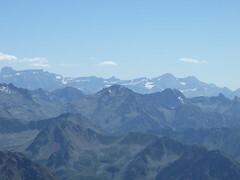 The tiny notch on the horizon just visible in the photo on the right is a high pass at the Cirque de Gavarnie. To the north, we had views away from the mountains. It was like being in a plane. 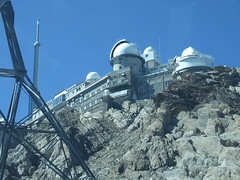 There is an observatory on the top of Pic du Midi, it must have been a massive undertaking to construct - and the vision that somebody must have had to go up there and see that construction was possible is amazing. We ate a meal at the restaurant at the top of the mountain. The restaurant is woefully small compared to the numbers of people up there, and although we got a table by sheer chance, it took ages to get served. The guys up there were rushed off their feet. 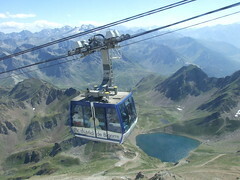 The cablecar down took an awfully long time too - that was needless. 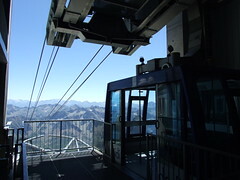 They could have operated a timed ticket system whereby when you want to descend, you pull a ticket and it has a time on it, you could then go off and do something else until your allotted time. Instead, they operated the 'big queue' system. 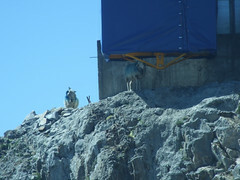 On the way down, we looked back and saw sheep climbing around on the sheer cliff beneath the observatory, it was impressive to see them casually start to move down what looked like a sheer cliff-face. The original plan was to go up to the Grottes de Bétharram, but we simply didn't have the time to get over there. 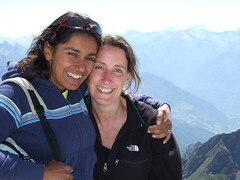 Instead, we looked in some of the touristy places in La Mongie (nothing to write home about) and had a crêpe.